With over 10 years experience playing at simchas throughout the tri-state area, from the largest wedding to the smallest simcha, I work with my clients to make their simcha as special as possible. I use the highest end technology, and have developed an unique style that people really enjoy. From a full orchestral sound for chuppahs to the most leibedig music for dancing, I am constantly working to ensure the best sound quality. I am also a music teacher, and composer. I have produced and realeased my own album called Hodu L'Hashem. I have a home studio, for small projects. See my website for more information and to hear samples of my music. One Man Band and a Professional Singer for any occasion - Weddings, Bar-mitzvahs, Sheva Berachos and Vorts. Mendy Plays Guitar and Keyboard: Kumzitz with a guitar at every Simcha. Get more for your wedding! 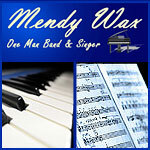 Don't forget to mention ChossonKallah.com when visiting Mendy Wax. Mention ChossonKallah.com, when booking Mendy Wax for your wedding and you'll get $50 off your total bill.